I recently revisited my old diaries when fellow author Terra Elan McVoy approached me about participating in a diary share campaign she is organizing to launch her new book, This Is All Your Fault, Cassie Parker, which is out TODAY. To promote the campaign, Terra gathered diary pages from several authors, including me. If you follow the hashtags #diarydare and #yourfaultCassie on Twitter and Instagram, you can check out some of our old diary entries! You can also join in the fun for a chance to win a prize by sharing pages from your own diary! A link to details appears at the end of this post. Most of you know that my own books, The Boy Project and The Boy Problem were influenced by my old school diaries. Reading through my diaries reconnected me with the feelings I had as a tween and teen. To me, this is the most important thing about diaries. They are perhaps the only place where we can be completely free with our feelings. And this connection to feelings is what makes books written in diary formats so appealing to young readers. I wrote an article about this very thing a while ago for The 4:00 Book Hook, a wonderful newsletter for book lovers that is no longer in print, so I thought I’d share that article here today in celebration of It’s All Your Fault Cassie Parker and diary keepers everywhere! A diary is a safe place where we can share our most secret feelings. True? Of course! It is what makes diary format books so appealing to young readers. These books employ first person narrators who share feelings with their diaries, and thus their readers, that they don’t share with anyone else. This creates a sense of kinship between reader and narrator that is almost immediate. Adults searching for a way to talk about feelings with the children they care about might find a diary format book a doorway into conversation. Talking about feelings presented through the eyes of a narrator can launch discussion about a child’s own feelings. One of my favorite books for very young readers is Diary of a Worm, a picture book by Doreen Cronin. Cronin’s simple text consists mostly of one sentence entries, but Worm communicates his feelings about friends and family very effectively. He touches on familiar subjects like nightmares, being laughed at by peers, and getting in trouble with parents: all things that evoke strong feelings for kindergarten aged children and younger. 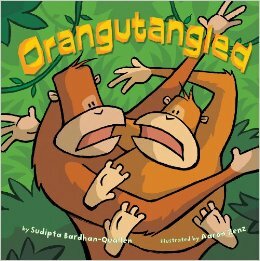 What a great book to use to start a discussion about the feelings these children experience almost daily! Elementary school readers might enjoy Amelia’s Notebook by Marissa Moss. Amelia expresses some very strong feelings about having to move to a new state– she hates it – on the very first page. Through colorful drawings as well as her words, Amelia addresses the pain of leaving a home and a best friend behind and the struggles of finding a new friend. Children will be able to relate to and talk about Amelia’s feelings of being out of place and on the outside of things even if they haven’t experienced moving. 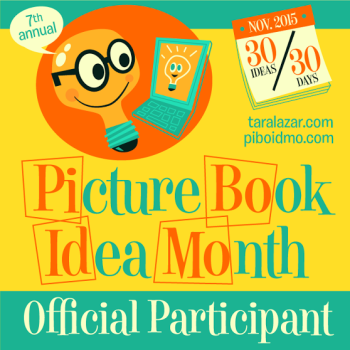 A common theme in diary format books geared for the middle grade audience is social awkwardness. This is true of the wildly popular Diary of a Wimpy Kid series by Jeff Kinney. Through narrator Greg Heffley, Kinney captures some of middle school’s most awkward moments. Spring boarding a discussion with this comical book would be a non-threatening way to discuss fitting in and decision making with middle school aged children. The hardest feelings to discuss with our children are those they experience when they enter young adulthood. YA books written in the diary format often deal with angst regarding social pressures, sexual curiosity, and drug usage. In Cathy’s Book by Sean Stewart, Jordan Weisman, and Cathy Briggs, Cathy wakes up to find a needle track in her arm. She can’t remember much about the previous night, and is forced to wonder if she’s been drugged and taken advantage of by her ex-boyfriend. Because her parents are virtually absent, Cathy must struggle with her feelings alone. The children in our lives don’t have to struggle with feelings alone. There are many wonderful diary format books on the market today. Share one with your favorite reader and discuss. And writers out there… as a writing exercise, try letting your characters write in their diaries, whether you use it in your book or not, it is a great way to get in touch with your characters’ feelings. Don’t forget to check out and participate in Terra’s #diarydare campaign. Click HERE for details! *Share the love contest winners announced at the end of this post. Febuary is the month to think about affairs of the heart. Not coincidentally, it is the month of both Valentine’s Day, and American Heart Month, a time to think about heart health. For more information about how to check out your heart health, visit The American Heart Association’s website. For thoughts on love from some famous nerdy chicks, keep reading! I love these words! Especially Audrey Hepburn’s. Do you have a favorite quote about love? We’d love to hear it! Here’s hoping February is turning out to be a lovely month for all of you. Winners will also receive a free 20 minute Skype visit for your class or for a small group. To enter just enter the short form below. Contest ends on midnight EST on February 28. Kim, Janet, Suzy, Karen, and Debbie. An email has been sent to each of you. Leave a comment here if you do not receive it. Thank you to all who entered! Winners were selected using the Random Number Generator at Random.org. 3 easy ways to double your entries, tweet about this giveaway and tag me @kamikinard, give it a shout out on Facebook and tag my author page, or leave a comment! Whether or not you enter the giveaway, you can still get a free Skype visit from myself or Sudipta for World Read Aloud Day. Click HERE for details. Good Luck Everyone! And if you want a closer look at the erasers that come with the prize pack, check out what Mr. Etkin’s class did with them last year. Bet you didn’t know erasers could dance! You know those beautiful home gardens? The ones featured on Pinterest or Facebook that are bursting with color, not a weed in sight, picture perfect wicker baskets loaded with cut flowers or fresh vegetables of the season. Yeah. That. Is. Not. My. Garden. Despite my suburban existence, I like to think of myself as a gardener. The idea of planting seeds, nurturing them, and then reaping the harvest is immensely appealing to me. Its all the actual work that gets a bit dull. Starting out is the easy part. I’m full of ideas and inspiration. Then as the weeks and months drag on, I lose a bit of steam. Ok, I lose a lot of steam. The poor bean plants sag as they wait for me to come pick. If they could give me a holler, I ‘m sure I’d get an earful. As writers, if we’re not careful, the same thing can happen to our manuscripts. We start out loaded for bear. Ideas to spare. Eager to outline plots and characters, and to get writing. We have energy to burn. As the first sprigs of green come to life, in the form of pages and chapters, we pat ourselves on the back, our energy high, our spirits soaring. We’re sure this will carry on forever. Then it rains. We struggle with the next plot twist. A heat wave makes being outside unbearable. We begin to dislike our own character and doubt this story idea had any merit in the first place. 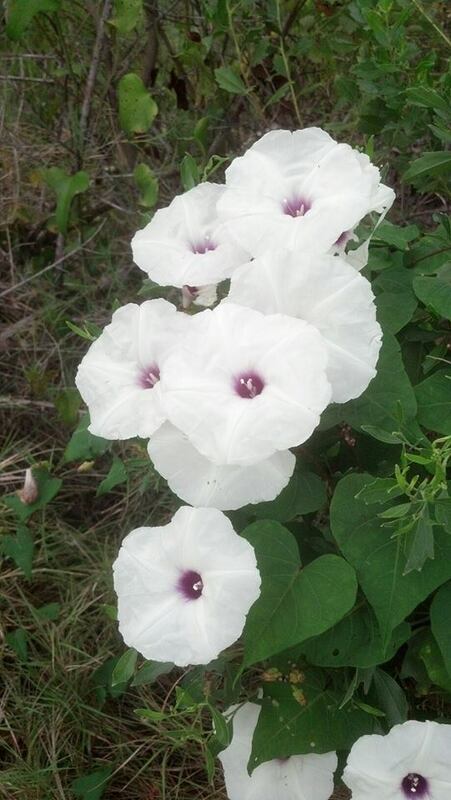 Then when we finally get to the garden, we find its almost taken over by weeds. We scrap a thousand words in an effort to find the good stuff. And of course we must battle the temptation of the next energizing idea. When one story is a struggle, it is so easy to get wooed by one of the many thoughts that constantly whiz back and forth in our minds. Those ideas can be so shiny! They look terrific. They feel new and glossy and full of promise. And of course we are completely capable of convincing ourselves that if only we set aside our current work and switched gears, then oh the words would flow! Of course weeds will grow in any garden. Rain will fall. Heat waves will sap our energy. And we’ll be tempted to throw in the towel. Don’t give in! Writing takes extreme patience. It takes the diligence to write day after day, week after week, whether that writing yields a single paragraph or several chapters, we must keep going. Every word is progress. I have a mantra I like to tell myself when writing doesn’t flow. It’s this. Word by word, page by page, a story grows. Jot that on a sticky note and put it where you write. Like my garden, a work in progress doesn’t always look picture perfect. Know that you will get muddy. There will be annoying bugs. And know that this is perfectly normal! Writing involves tremendous work. Sometimes it means sacrificing bits we adore so that the rest can grow. But it will grow. Maybe not as fast as we’d like. But the shoots will rise. The leaves will unfold. And before you know it, you’ll be reaping the rewards. Thank you Shannon for that great analogy. I agree 100 percent. Writing is work…. but the rewards are beautiful! 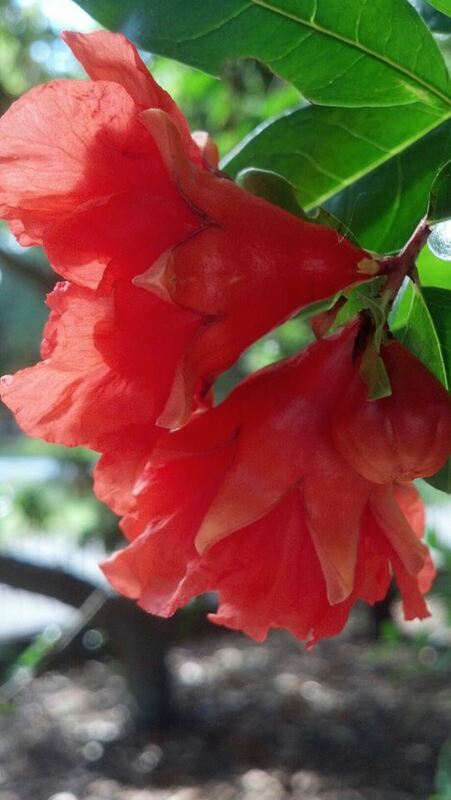 Readers, take a moment to find out about What Flowers Remember, then enter the super-easy to enter giveaway! 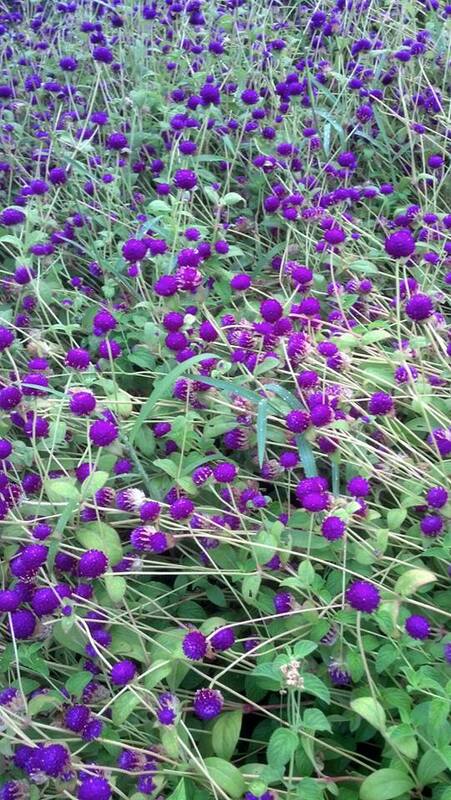 Most folks probably think gardens only get tended when they’re blooming. But most folks would be wrong. According to the almanac, a proper gardener does something every single month. Old Red Clancy was definitely a proper gardener. That’s why I enrolled myself in the Clancy School of Gardening. If I was going to learn about flowers, I wanted to learn from the best. as many memories as she can. Her mission is to gather Old Red’s stories so that no one will forget, and she corrals everybody in town to help her. What Flowers Remember is a story of love and loss, of a young girl coming to understand that even when people die, they live on in our minds, our hearts, and our stories. *Note: A portion of the proceeds from the sale of this book are donated to the Alzheimer’s Association. Shannon Wiersbitzky is a middle-grade author, a hopeless optimist, and a lover of nature. Her first novel, The Summer of Hammers and Angels, was nominated for the William Allen White award. Born in North Dakota, Shannon has called West Virginia, Florida, Minnesota, North Carolina, and Michigan “home” at some point in her life. She currently lives in Pennsylvania with her husband, two sons, one rather dull fish and her never dull mutt Benson. 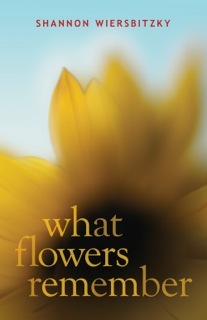 Enter to win a copy of What Flowers Remember. All we need is your name and an email address, so we can notify the winner. The contest runs until Midnight May 20, 2014. For Double Entries, leave a comment about writing, gardening, or this post! When I first heard about this project I was super excited to work with Chad (creative director at Abrams) and Sudipta. That excitement quickly turned to fear when I realized I’d never really drawn dinosaurs before. Not even as a kid. Plus there seemed to be a whole lot of dinosaurs I’d never heard of. I think there were like five dinos when I was a kid and half of them don’t even exist anymore, er, I mean, they ALL don’t exist anymore, but uh…you get the point. I realized I couldn’t just fudge through with a vague lizard creature. So I started where all ignorant people do, with a Google search. Fear turned to terror as I collected images. NO WAY WAS I GOING TO PULL THIS OFF!!! Then I had an idea. 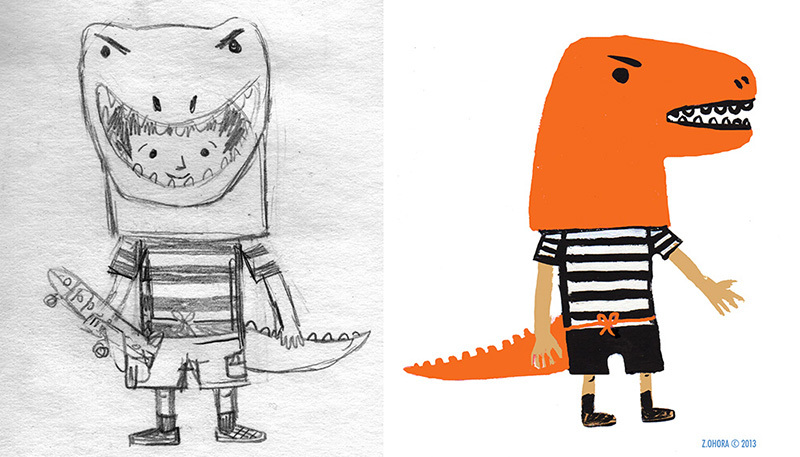 One that might appear brilliant enough to fool everyone into NOT noticing I can’t draw dinosaurs. 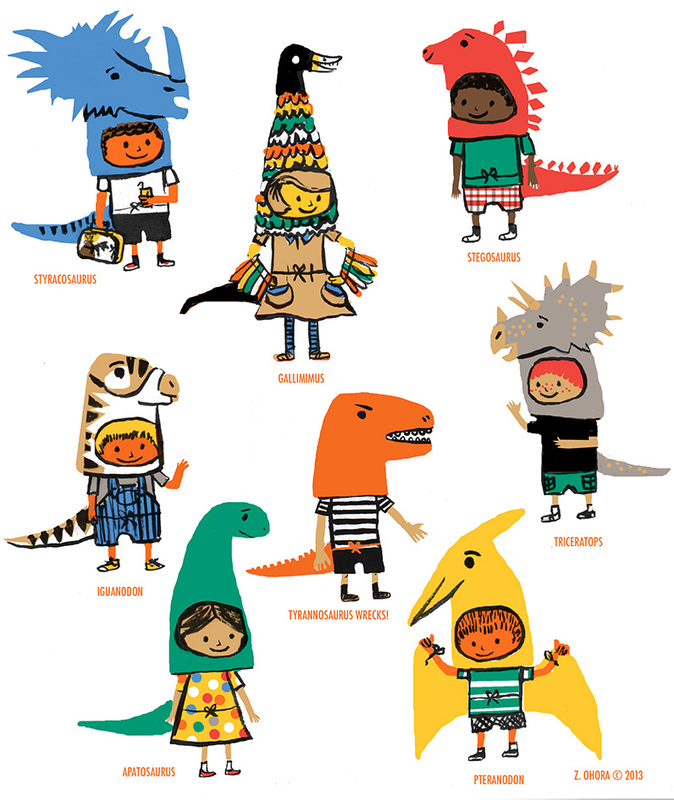 What if it was kids DRESSED as dinos instead? This seemed like the perfect solution as it allowed me a good deal of creative license. Then Abrams politely showed me a book that already had my “brilliant” idea in it that came out two years earlier. 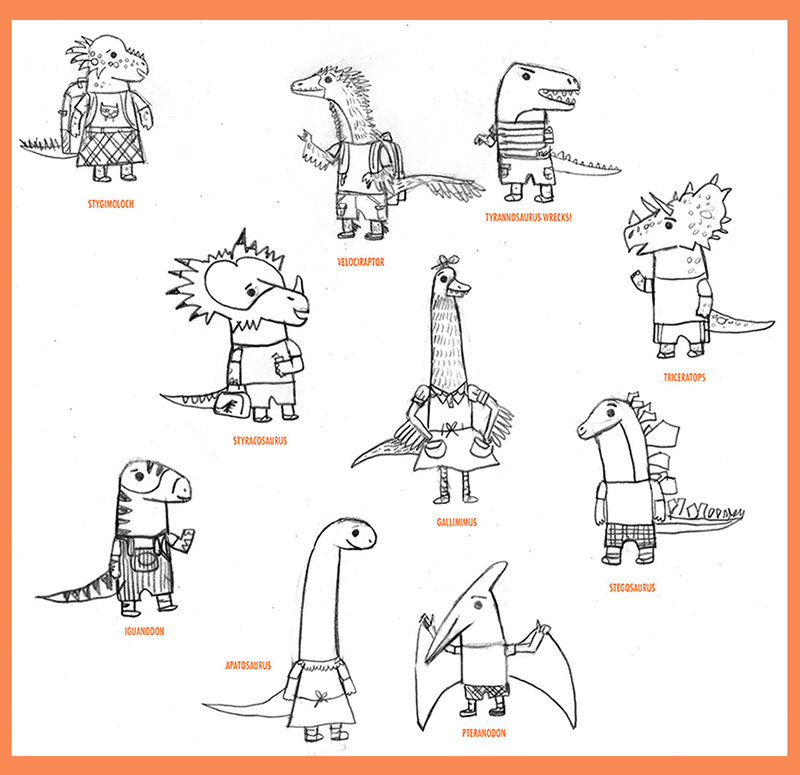 Illustrator practices and practices drawing dinosaurs! Until finally the characters ended up having some human qualities but were most definitely dinosaurs! Fortunately everyone was happy with the new version and that’s what you see in the book. Fear of failure forced me to get my proper dinosaur education on. And best of all Sudipta was happy with them too. Sometimes in a collaboration you have to go way out of your comfort zone. 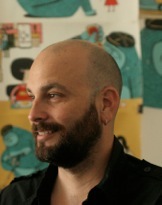 Zachariah OHora is an illustrator and author of a number of children’s books. His debut STOP SNORING, BERNARD! 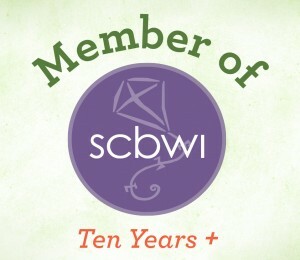 was awarded the Society of Illustrators Founder’s Award and was chosen as the PA One Book for 2012. His book NO FITS NILSON! was awarded a Kirkus star and was the Huffington Post Book of the Year for 2013. He lives and works in the tiny village of Narberth, PA with his wife, two sons, and two cats. Thank you, Zack, for such a great and insightful post. And just so you know, I hadn’t heard of a Gallimimus either — not until my then 4-year old son educated me on that and all the other dinos in the book (except the Tyrannosaurus — I had heard of that!). In honor of TYRANNOSAURUS WRECKS, we here at Nerdy Chicks Rule are going to give away TWO prizes to one lucky winner. 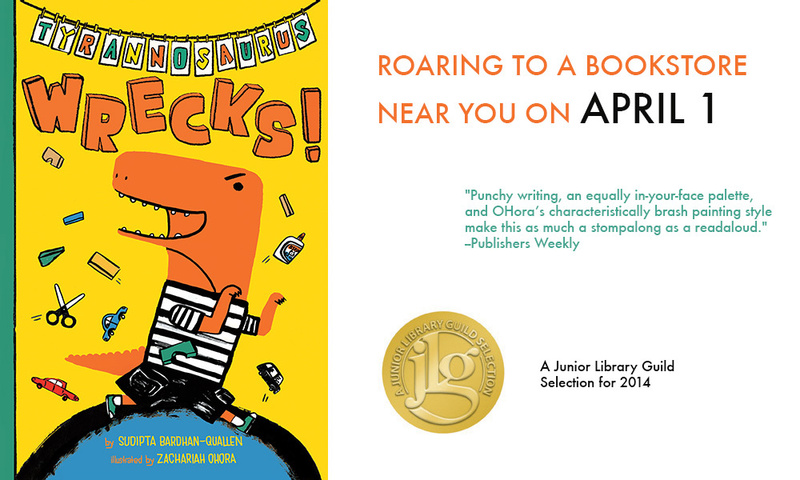 First, the winner is going to score a copy of TYRANNOSAURUS WRECKS! signed by both Zach and me! And second, the lucky winner will get an original sketch from the book, signed by the illustrator himself! Book and art — how can you not like that? How do I win? asks my faithful blog reader. 3. Every time you share using the handles you’ve registered, you’ll get one entry. The contest will close on April 7, 2014 at 11:59pm. At that time, we will gather up all the entries and choose a WINNER! Have you ever had a day that starts out bad…and then gets worse and worse and worse? One of those days where you know it’s one disaster after the other no matter what you do? And you know that fighting it won’t make it better…but you fight it anyway? It was a day like that that inspired ORANGUTANGLED. I’m proud to announce today is this darling book’s birthday! In honor of this book, we have a very special giveaway. 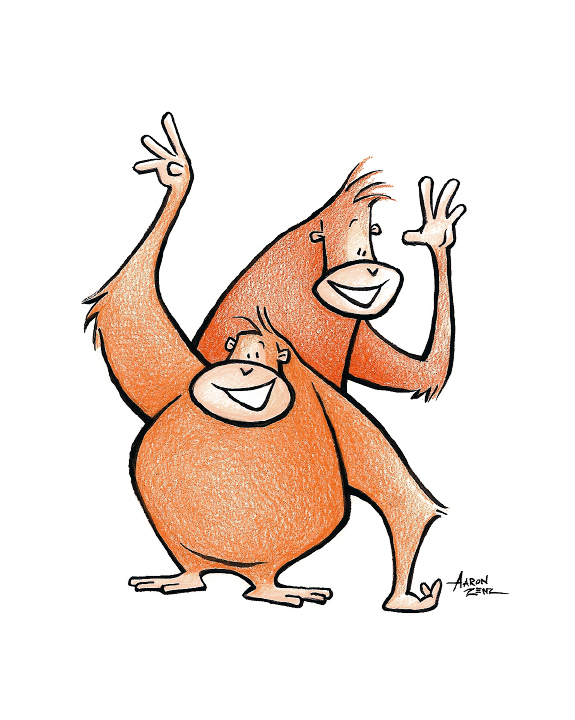 Illustrator Aaron Zenz has very graciously created an original piece of ORANGUTANGLED artwork. I’m sure you’re all wondering How do I win??? 3) Every post or tweet will count as one entry (make sure you make your Facebook posts are public so we can give you credit! Even better, tag Sudipta Bardhan-Quallen, Children’s Book Author on the Facebook posts!). Keep spreading the word, increase your odds of winning. 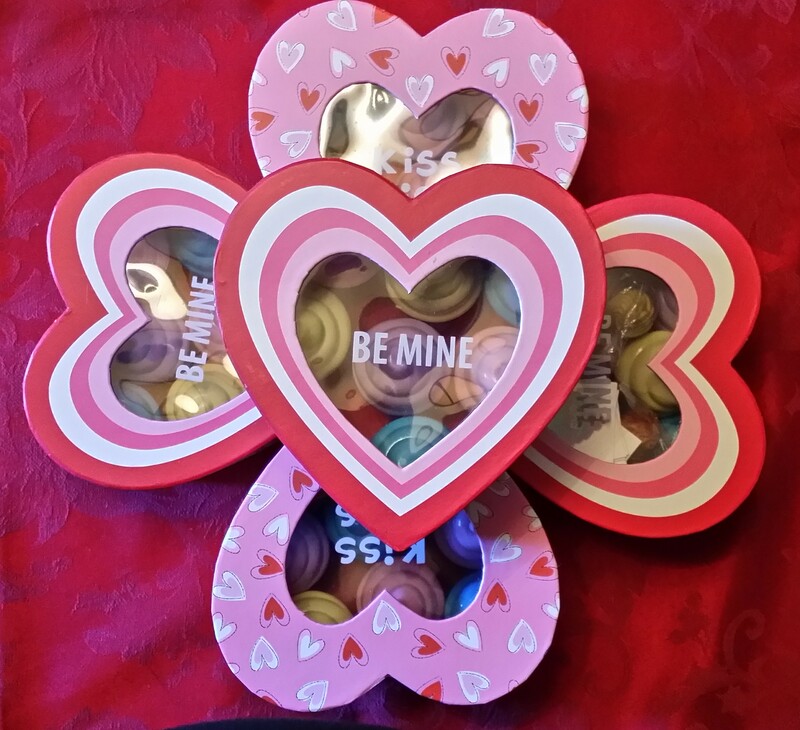 The contest will close on February 17, 2014 at 11:59pm. At that time, we will gather up all the entries and choose a WINNER! Do you like winning? Want to win more? Check out Corrine Jackson’s giveaway, too! 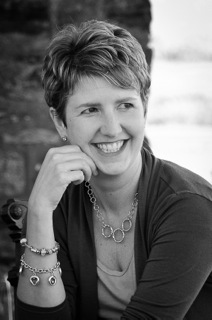 Author Corrine Jackson on Strong Female Characters plus a Giveaway! In philosophical terms, human agency is “the capacity of an agent (a person or other entity, human or any living being in general, or soul-consciousness in religion) to act in a world.” The key word there is ACT. In my undergrad literature classes, we spent a lot of time discussing how agency is what separates our heroes from secondary characters. Heroes take action. They are a force to be reckoned with. How much agency did Oedipus Rex have over his fate vs. the oracle predicting the outcome? How much power did Othello exert in the circumstances that led to the murder of his wife Desdemona, or was he merely an instrument for Iago? What we’re really talking about when we talk about human agency is the power to act. And writers know that action is what propels a story forward. Too often female characters are powerless to make choices that impact their future. Male characters make decisions for them. This female character is waiting around for a male to save her. She is defined by the man in her life, rather than by the choices she is making. She lacks agency. Sometimes this is used as a plot device, until the last moment when she finally saves the world via some magical power. Strong female characters, like their male counterparts, will ACT. She will play a role in her fate, and make choices and decisions that push the story along. In my Sense Thieves series, Remy has the power to heal people with her touch, but she’s been raised in an abusive household, taught that people inevitably cause pain. That description of her background isn’t what makes her strong. She could be waiting for a hero to save her. But despite her circumstances (maybe because of them), Remy chooses to help people, to save people because nobody saved her. She heals people even though it frequently puts her life at risk and always causes her pain. That choice to act, even when it’s ill-advised (and puts her in a great deal of danger in PUSHED) makes her strong in my book. The decisions don’t have to be good ones, but the character does have to be making choices to drive the story forward. A female character in this role is a strong one, in my opinion. She didn’t know how far she’d go—until she was pushed. Remy O’Malley was just learning to harness her uncanny healing power when she discovered the other, darker half of her bloodline. Now she lives trapped between two worlds, uneasy among her fellow Healers—and relentlessly hunted by the Protectors. Forced to conceal her dual identity, and the presence of her Protector boyfriend Asher Blackwell, Remy encounters a shadow community of Healers who will put her loyalties to the test. The Giveaway below is officially over. Entries were numbered and the total number was entered into the Random Number Generator at random.org, which selected Michele. Congratulations Michele! Giveaway(s)! There are TWO ways to win a copy of PUSHED! 1. Comment on this post with the name of your favorite strong female character. I hope we get a long list because I’d love to make a strong-female pie chart ! 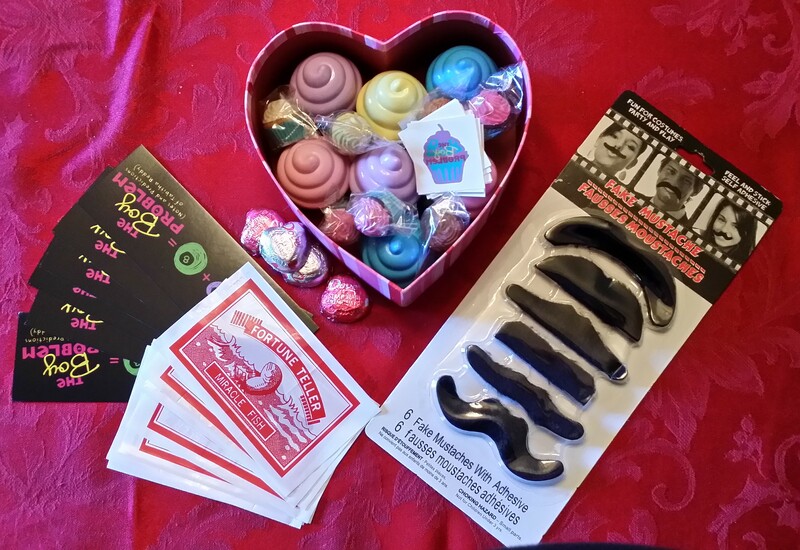 Contest ends on midnight February 15 to enter this blog’s giveaway! A winner will be chosen using random.org. 2. Enter the official blog tour giveaway here: a Rafflecopter giveaway ! You can enter both giveaways. Yay for strong female characters! 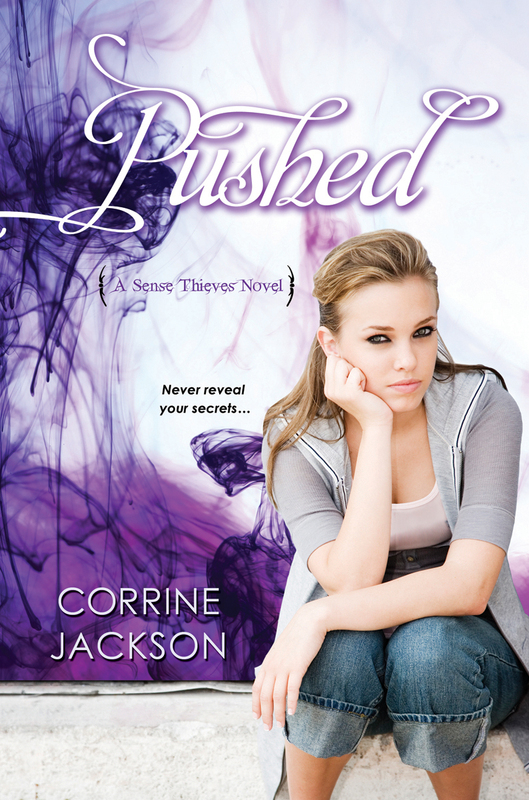 More about PUSHED author Corrine Jackson: Young adult author Corrine Jackson lives in San Francisco and has over ten years experience in marketing. She has bachelor and master degrees in English, and an MFA in Creative Writing from Spalding University. 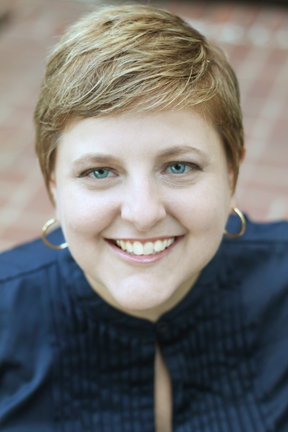 Her novels include If I Lie (Simon Pulse) and the Sense Thieves trilogy (KTeen), comprised of Touched, Pushed, and Ignited (5/27/14). Visit her at CorrineJackson.com or on Twitter at @Cory_Jackson. 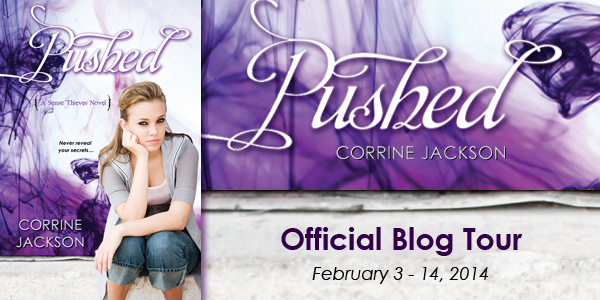 Visit other stops on the PUSHED blog tour by clicking HERE. Click to check out our FREE writer’s workshop!